Woodlawn and Washington Park sprung up in the late-nineteenth century, accompanied by a rapid influx of (primarily European) immigrant populations and increased industry driven by the 1893 World’s Fair. During the twentieth century, Woodlawn and Washington Park served as a hub of political and cultural activity: important figures from Saul Alinsky to Jesse Owens are associated with the area. More recently, Woodlawn and Washington Park have seen the departure of industry and the decline of infrastructure. This past year, the city began an effort to unload vacant properties in these neighborhoods by selling them for $1. Still, Woodlawn and Washington Park continue to live up to their historic reputation for activism. Offices for STOP—Southside Together Organizing for Power—remain at 61st and St. Lawrence. Community organizations have successfully advocated for change at the site of the formerly dilapidated Grove Parc housing units. The now-shuttered Woodlawn Mental Health Center stands as an epicenter (both symbolic and geographic) of the ongoing movement to prevent the city from closing the rest of its public mental health clinics. STOP’s youth advocacy group, FLY—Fearless Leading by the Youth—has received national attention for its efforts to bring a trauma center to the South Side. The trauma center campaign is a particularly fractious example of Woodlawn and Washington Park’s frequent interactions with the University of Chicago. In a 1964 agreement with Woodlawn residents, the UofC agreed to not expand southward past 61st Street. In 2013, as part of a UofC initiative, the artist-planner-entrepreneur Theaster Gates opened the Washington Park Arts Incubator. 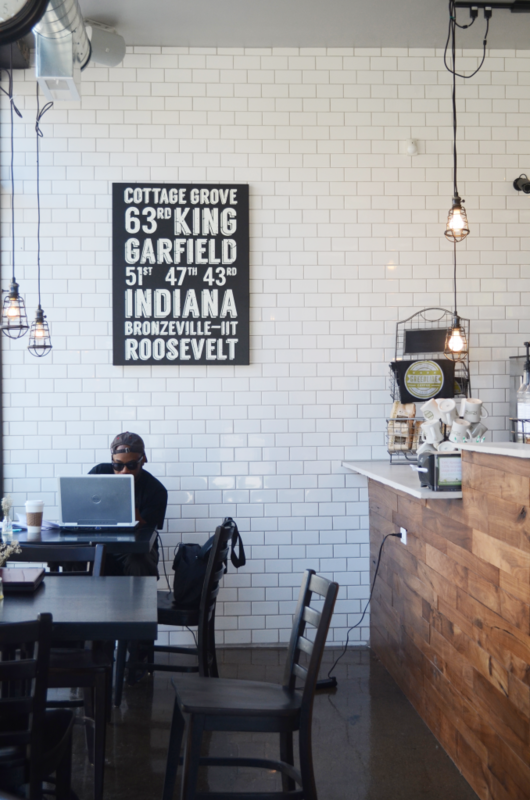 This year saw the opening of Gates’s second Washington Park venture, the Currency Exchange Café, designed in Gates’s typical “reuse model” of repurposed production. The café neighbors the Incubator across from the Garfield Green Line.